Scientists at EPFL have demonstrated a new method that can be used to greatly improve the safety and efficiency of gene therapy using the patient's own stem cells. Ex vivo gene therapy is a medical technique in which stem cells are taken from the patient, and their deficient genes are switched with healthy ones. The stem cells are grown in the lab and re-inserted into the patient. However, this method often has health risks, such as leukemia and mutations. 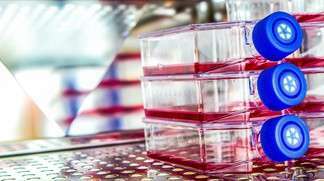 The problem is that most stem cells cannot be grown efficiently with current technologies, and the resulting cell population in the lab can contain a mix of healthy and unhealthy cells. Scientists at EPFL have developed a selection process that can detect the cells that have take up the healthy genes with great specificity, greatly reducing the risks of ex vivo gene therapy. The method, successfully tested on cells from a skin disease, is published in EMBO Molecular Medicine. Yann Barrandon at EPFL and Centre Hospitalier Universitaire Vaudois (CHUV) led a team of researchers that has developed a safe "clonal strategy" for ex vivo gene therapy that can be easily performed before cells are transplanted back into patients. The strategy uses a set of stringent quality control assays inspired from the protocols used by biotech companies and regulatory affairs to produce medicinal proteins through genetically engineered mammalian cells. The quality control assays aim to satisfy several selection criteria before the cells are transplanted back into the patient. Specifically, the genetically modified stem cells must: show high growth potential; produce the protein needed to fight the disease; sustain long-term tissue regeneration in the patient; sustain long-term correction of the disease; not run the risk of forming tumors; have properly integrated the new genes into their genome and; not spread across the patient's body. The researchers tested their strategy of criteria and assays on stem cells from the skin of a 4-year-old child suffering from a severe condition called dystrophic epidermolysis bullosa, which causes extremely fragile skin, and can even be lethal. The cells from the child were isolated, put through the quality control strategy and implanted in mice to see if they would cause tumors. After more than 100 days, no tumors were recorded. The study shows that the safety and efficiency of ex vivo gene therapy depends on creating a homogeneous ("clonal") culture of cells rather than the more widely used mixed populations. This approach is more demanding, and Barrandon's lab is actually one of the few in the world who have successfully created and maintained single-cell stem cultures. However, the study is expected to open a new chapter in the use of gene therapy methodologies, making them safer and more efficient for patients. The next step for the researchers is to test their method on actual patients and to develop tools to facilitate the transfer of the single cell technology to other laboratories. This work is ongoing in collaboration with EPFL engineers. They are now in the process of developing a pilot clinical trial. "This is a proof-of concept study," says Yann Barrandon. "But the greatest aspect is that now any clinical lab in the world can take our strategy and adapt it to the disease that they are targeting."